BLACK & DECKER PI800BB 800 Watt Dual-Outlet Power Inverter , Avi Depot=Much More Value For Your Money! 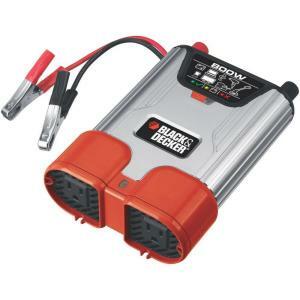 The Black & Decker 800-Watt Dual-Outlet Power Inverter enables you to use your car battery power to provide the energy to run 1 or 2 small electrical appliances when you're away from home. This apparatus provides 800-watt continuous power and up to 1,600 watts at its peak. With the USB port, you can also recharge cell phones and other small electronic devices.